Feuding surgeons at a troubled cardiac unit worked in a culture of hostility, tribalism and mistrust, inspectors say. Complex heart operations were moved out of London's St George's Hospital in September after a leaked document revealed a "toxic" row had contributed to an above average death rate. The Care Quality Commission (CQC) said mediation worked only briefly, with "poor behaviour" soon returning. The trust said its cardiac surgery was safe and improvements had been made. When CQC inspectors visited over three days in August and September, they found top physicians with "strong" personalities unable to work together effectively. 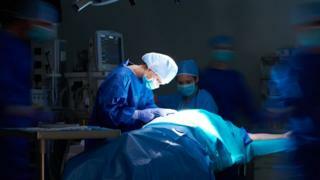 According to their subsequent report "consultant surgeons mistrusted each other, as well as cardiologists, anaesthetists and senior leaders." There was a culture of "tribalism", one consultant said, and staff told inspectors the cardiac surgical team "had not worked effectively for several years". Inspectors wrote: "Consultants did not work collaboratively, share responsibility or resolve conflict in a constructive and timely manner. "Staff did not work together to ensure delivery of high-quality, safe and effective services that put patients at the centre." CQC's chief inspector of hospitals, Professor Ted Baker said: "Issues such as weak leadership, internal unrest and multiple electronic patient record systems are just some of the problems affecting St George's Hospital cardiac surgery unit." Image caption Complex heart operations have been moved out of the cardiac surgery unit since September to allow "improvements to be made"
The leaked report in the summer, by former NHS England deputy medical director Mike Bewick, found the unit, in Tooting, had a cardiac surgery death rate of 3.7% - above the national average of 2%. It said the team was consumed by a "dark force" and patients were put at risk. The latest data shows mortality rates at the hospital, which carries out about 1,000 cardiac operations a year, have improved, with the cardiac surgery death rate reduced to 2.7%. The trust has been ordered to make a series of improvements, including a call to address cultural problems within the service and to resolve issues over leadership. In September, it was announced all complex heart operations would temporarily be moved to other hospitals, although routine cardiac surgery would remain at the unit. Managers said the move, which affected about 100 patients, would "give us space to make improvements." Responding to the CQC report, Jacqueline Totterdell, chief executive of St George's, said: "The service experienced significant challenges earlier this year, and it will be reassuring to the communities we serve that the CQC has confirmed it is safe. "Of course, this does not change the fact that significant improvements are required - and significant progress has been made since the CQC's visit back in August."